Analy­sis of the most pop­u­lar phras­es used by UK shop­pers who are search­ing for this year’s ‘must have’ Christ­mas gifts via Google has revealed that Ama­zon and Argos cur­rent­ly have the largest share of search in the run up to the hol­i­day retail peri­od. For major UK high-street and online ecom­merce retail, search will be an invalu­able chan­nel for the 2015 Christ­mas peri­od. By year end, total online retail sales for 2015 are expect­ed to exceed £116bn1 (rep­re­sent­ing 12% YoY growth from 2014 fig­ures). Fuelled by such remark­able growth in online retail sales, search has nat­u­ral­ly become the most sig­nif­i­cant chan­nel for con­sumers as they under­go their sea­son­al pur­chase jour­neys. Organ­ic search in par­tic­u­lar is regard­ed as one of the most trust­ed sources of infor­ma­tion by con­sumers2. Every day, mil­lions of peo­ple in the UK rely on organ­ic search to research, eval­u­ate, and even­tu­al­ly make their sea­son­al and Christ­mas pur­chas­es. Addi­tion­al­ly, the grow­ing preva­lence of mobile and mul­ti-device search means that the “always-on” avail­abil­i­ty of the chan­nel can dri­ve influ­ence across entire con­sumer pur­chase jour­neys at any moment, not just on retail­ers’ web­sites but across a range of pub­lish­ers at mul­ti­ple con­sumer touch­points. At Christ­mas, when com­mer­cial stakes for retail­ers are par­tic­u­lar­ly high, win­ning or los­ing in the organ­ic search can make or break the bank. Brands who per­form poor­ly in organ­ic search are often forced to invest heav­i­ly in paid media and adver­tis­ing to make up for short­falls in vis­i­tor and sales vol­umes, in a peri­od when such costs are fre­quent­ly heav­i­ly inflat­ed by high lev­els of com­pe­ti­tion. With so much at stake, we want­ed to under­stand what the land­scape might look like this Christ­mas, and to see which retail­ers are already posi­tion­ing them­selves to be most vis­i­ble and vis­it­ed web­site by con­sumers dur­ing the fes­tive peri­od. By analysing the most pop­u­lar phras­es used by UK shop­pers who are search­ing for this year’s ‘must have’ Christ­mas gifts via Google (look­ing at today’s data 3), we dis­cov­ered that that Ama­zon and Argos cur­rent­ly have the largest share of search in the run up to the hol­i­day retail peri­od. Our research explored over 7,000 key­words, rep­re­sent­ing a total of 8.5 mil­lion month­ly search­es in the UK between August and Sep­tem­ber 2015, focus­ing on typ­i­cal Christ­mas gifts (such as “Playsta­tion 4”, ”Apple iPad”, or “children’s bikes”) and iden­ti­fied which brands had the top mar­ket share over­all, and in a num­ber of sub­cat­e­gories such as ‘toys’ or ‘tech­nol­o­gy’. “Christ­mas shop­ping starts soon­er every year, and from as ear­ly as Sep­tem­ber we’ve been see­ing a mas­sive 8.5million search­es per month for prod­ucts, toys, and tech, which are like­ly to be big sell­ers this Christ­mas. Organ­ic search rep­re­sents a huge oppor­tu­ni­ty for retail­ers, but based on cur­rent data, some of the big play­ers might have to resort to cost­ly paid adver­tis­ing to make up for short­falls in their organ­ic vis­i­bil­i­ty if they want to cap­ture traf­fic and sales over the Christ­mas peri­od. Of course, the mar­ket, search behav­iours and vol­umes, and mar­ket­ing activ­i­ties will almost cer­tain­ly change in the lead-up to Christ­mas, and it’s there­fore dif­fi­cult to pre­dict win­ners and losers based on data relat­ing to how peo­ple search now. How­ev­er con­sid­er­ing that as many as 20 per­cent of con­sumers start their Christ­mas shop­ping in Sep­tem­ber4, in a chan­nel where overnight changes in strat­e­gy and per­for­mance are dif­fi­cult to achieve, and where brands typ­i­cal­ly oper­ate large, com­plex and hard-to-change ecom­merce web­sites — by cre­at­ing a league table which iden­ti­fies who’s win­ning and who’s los­ing today, we can begin to under­stand what the mar­ket might look like this Christ­mas. This report high­lights key stats, explores our find­ings, pro­vides some obser­va­tions, and details our method­ol­o­gy in more depth. Ama­zon (2.88 per­cent) and Argos (2.87 per­cent) have the great­est share of search in the UK across 8.5 mil­lion con­sumer search­es. Ama­zon have a clear lead over Argos in cat­e­gories such as ebook read­ers (15.85 per­cent of over­all ebook relat­ed search­es com­pared to Argos’ 2.39 per­cent) and audio prod­ucts (9.27 per­cent to Argos’ 2.88 per­cent). 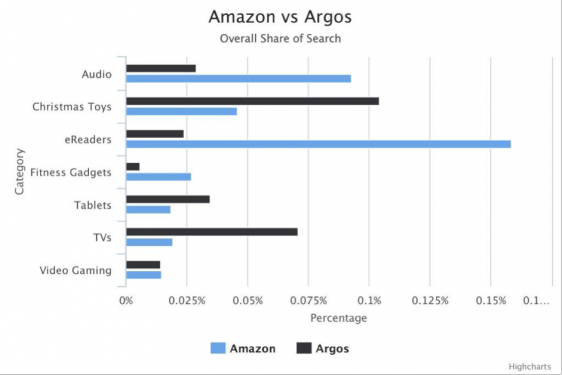 Argos have the larg­er share of Christ­mas toy relat­ed search­es with 10.41 per­cent of over­all share of search. Ama­zon by com­par­i­son have 4.56 per­cent. Apple (2.67 per­cent) are the third most vis­i­ble retail­er in the UK, despite hav­ing a much small­er prod­uct range and total rank­ing key­words. Cur­rys have the largest share of the TV relat­ed search­es with 9.16 per­cent, fol­lowed by Argos who have 7.08 per­cent. Ama­zon by con­trast have just 1.91 per­cent of the share of search for TV relat­ed search­es. Argos have the great­est share of search­es relat­ed to children’s toys with 5.72 per­cent. Toys “R” Us offer strong com­pe­ti­tion with 4.15 per­cent. Smyths Toys (1.55 per­cent) and The Toy Shop (0.8 per­cent) also fea­ture in the top ten most vis­i­ble retail­ers, show­ing that spe­cial­ist nation­al retail­ers are able to build a strong organ­ic search posi­tion with­in their spe­cif­ic niche. Apple have the great­est share of search­es relat­ed to tech­nol­o­gy with 3.79 per­cent. Over­all lead­ers, Ama­zon and Argos also per­form very well in the cat­e­go­ry with 2.88 and 2.26 per­cent share of search respec­tive­ly. Of the non-retail pub­lish­ers, Techradar have the great­est share of search, with 2.19 per­cent of the over­all share of search. 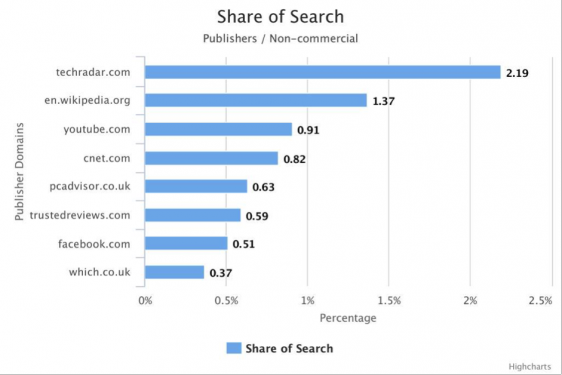 Wikipedia and Youtube fol­low close behind with 1.37 per­cent, and 0.91 per­cent share of search respec­tive­ly. Across like­ly trend­ing Christ­mas prod­ucts and top­ics this year, a few key themes stand out. As you would expect, there is inter­est in tra­di­tion­al presents such as bikes, soft toys, and gen­er­al chil­drens’ enter­tain­ment — but beyond this there are key areas of inter­est such as fit­bit and health tech­nol­o­gy, con­sole games and con­struc­tion toys such as lego prod­ucts. When visu­alised, it’s easy to see how these trends for toys and tech dom­i­nate peo­ples research. By analysing who ranks where for each term in this set, we can apply click­through-rate cal­cu­la­tions to the search vol­ume to iden­ti­fy the most vis­i­ble high-street and ecom­merce retail­ers across the organ­ic search chan­nel between August and Sep­tem­ber 2015. 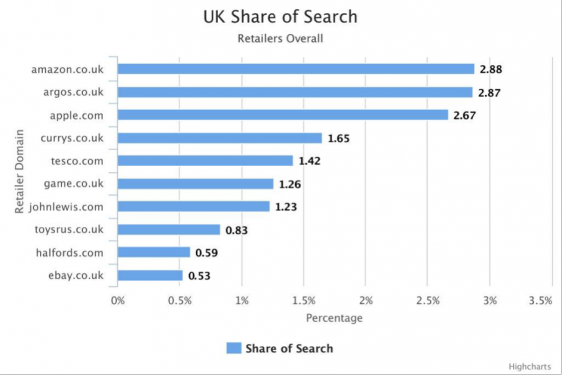 As the chart indi­cates, Ama­zon (2.88 per­cent) and Argos (2.87 per­cent) have a clear lead with the largest share of search amongst UK con­sumers. Both retail­ers have promi­nent organ­ic search posi­tions across a range of high-vol­ume prod­uct key­words such as “xbox”, “playsta­tion 4”, and “lego”, and both have thou­sands of rank­ing key­words over­all (Ama­zon have over 3,800 rank­ing key­words, and Argos almost 3,000), giv­ing them broad scope and vis­i­bil­i­ty across a range of prod­ucts. Apple occu­py the third spot, with a 2.67 per­cent share of search. The brand pro­vide a nar­row­er range of prod­ucts than the two lead­ing retail­ers, and rank for spe­cif­ic brand­ed terms such as “ipad”, “apple watch”, and “beats head­phones”. Nat­u­ral­ly Apple pos­sess a sig­nif­i­cant­ly small­er amount of rank­ing key­words (360 rank­ing key­words in total), how­ev­er this is coun­ter­bal­anced by a com­mand­ing organ­ic search posi­tion, mean­ing the retail­er is able to win a large share of over­all search vol­umes around their brand. Oth­er retail­ers in the top ten have built healthy posi­tions with­in their own spe­cif­ic nich­es. Cur­rys per­form very well for audio­vi­su­al search­es, and Game and Toys “R” Us have strong vis­i­bil­i­ty in the con­sole gam­ing and children’s toys mar­kets respec­tive­ly. Seg­ment­ing share of search by prod­uct cat­e­go­ry illus­trates how the two lead­ing retail­ers Ama­zon and Argos are com­pet­ing in spe­cif­ic mar­kets. As the chart shows, it is clear that Ama­zon have a clear lead over Argos in cat­e­gories such as audio (9.27 per­cent to Argos’ 2.88 per­cent) and most notably ebook read­ers (15.85 per­cent to Argos’ 2.39 per­cent) — which makes sense, when you con­sid­er Amazon’s monop­oly in the eBook space with their Kin­dle range. The sit­u­a­tion is reversed in the case of toys that are expect­ed to be big sell­ers this Christ­mas (such as Lego5 and Star Wars toys6), where Argos have 10.41 per­cent of the over­all share of search to Amazon’s 4.56 per­cent, tablets where Argos have 3.46 per­cent to Amazon’s 1.85 per­cent, and TVs where Argos have 7.08 per­cent over­all share of search to Amazon’s 1.91 per­cent. While this is by no means an exhaus­tive list of cat­e­gories across both retail­er sites, It’s inter­est­ing to note that with the excep­tion of video gam­ing, there is a clear divide in each of the category’s between the two lead­ing retail­ers. Whilst the two retail­ers may be neck and neck in over­all share of search, the areas where they are win­ning have a very dif­fer­ent flavour. Ama­zon per­form excep­tion­al­ly for brand­ed tech­nol­o­gy key­words such as “Kin­dle” and vari­ants of “head­phones” relat­ed search­es. 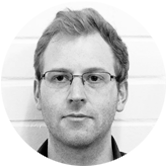 They also have a huge depth in long-tail key­words, visu­alised below (we’ve shown how many esti­mat­ed vis­its the site receives, by indi­vid­ual term, terms based on our data), rep­re­sent­ing their broad and impres­sive reach across a huge quan­ti­ty of prod­ucts, cat­e­gories and ranges. We can also see how Argos, on the oth­er hand, pos­sess a larg­er num­ber of toy-relat­ed key­words such as “scoot­er” and “kids bikes”, as well as home elec­tron­ics such as “beard trim­mer” and “flat screen tv”, but a small­er over­all breadth of terms. In both cas­es, organ­ic search per­for­mance appears to reflect and com­pli­ment a larg­er busi­ness strat­e­gy; for exam­ple, in the UK Ama­zon are not big play­ers in the TV mar­ket (per­haps due to the ben­e­fit-to-cost ratio around exhi­bi­tion, ware­hous­ing, and stor­age of such large tick­et items); con­verse­ly, though, Argos’ reach and depth is strict­ly tied to (and fuelled by) the prod­ucts it stocks and fea­tures on their web­site, where­as Ama­zon can extend their reach through cus­tomer mar­kets and greater breadth of small­er items. In many cas­es, the organ­ic reach of retail­er is tied intrin­si­cal­ly to the nature, size, and breadth-of-range of the prod­ucts it retails. Over­all share of search of the chil­drens’ toy mar­ket was cal­cu­lat­ed from over 1.6 mil­lion search­es, encom­pass­ing pop­u­lar search­es for cat­e­gories that are like­ly to be big sell­ers this Christ­mas such as Christ­mas toys, Lego, Star Wars toys, and ted­dy bears. Lego dom­i­nates the toys space; their strat­e­gy of cap­i­tal­is­ing on every oth­er major fran­chise, event and media brand gives them enor­mous reach, and ensures that they’re right up there with what­ev­er is trend­ing this Christ­mas. The chart below reflects the sheer scale of their reach, mak­ing it no sur­prise that they con­tin­ue to be con­sid­ered as one of the most influ­en­tial and trust­ed brands in the world7. Oth­er areas of inter­est shine through, too, such as tra­di­tion­al ‘ted­dy bears’, and oth­er toy brands such as ‘pep­pa pig’. Argos (5.72 per­cent) have a clear lead in the UK mar­ket, again with a promi­nent organ­ic search posi­tions across almost 800 key­words. Toys “R” Us per­form very well in the spe­cial­ist ver­ti­cal (4.15 per­cent) offer­ing Argos strong com­pe­ti­tion in the toy mar­ket. With Smyths Toys (1.55 per­cent) and The Toy Shop (0.8 per­cent) also with­in the top ten, it is clear that spe­cial­ist nation­al retail­ers are able to build a strong organ­ic search posi­tion with­in their spe­cif­ic niche. Ama­zon, Tesco, John Lewis, Hal­fords, and ebay again make an appear­ance in the top ten. Notably, Hal­fords per­form com­par­a­tive­ly bet­ter than they do in the over­all share of search rank­ing, leapfrog­ging com­pet­ing retail­ers Tesco and John Lewis with promi­nent organ­ic posi­tions for search­es such as ‘scoot­ers’ and ‘kids bikes’. Over­all share of search of the tech­nol­o­gy mar­ket was cal­cu­lat­ed from over 5.8 mil­lion search­es, encom­pass­ing pop­u­lar cat­e­gories includ­ing con­sole gam­ing, smart­watch­es, fit­ness, tablets, audio, TVs, ebook read­ers, and drones (and exclud­ing home appli­ances and white goods). Search­es for tech prod­ucts and gifts are more diverse than oth­er areas; brands and top­ics are more dis­trib­uted, and more indi­vid­ual prod­ucts and areas stand out. In par­tic­u­lar, there is a focus on games and gam­ing (con­soles and the lat­est releas­es), media, health tech­nol­o­gy and audio equip­ment. 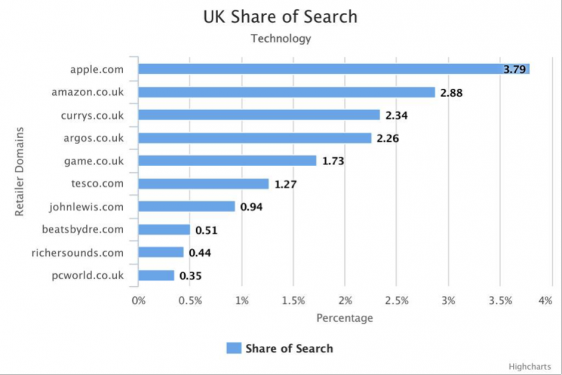 Apple are the clear win­ners here, with 3.79 per­cent of the UK tech­nol­o­gy share of search — per­haps not a sur­prise con­sid­er­ing their prod­uct range and over­all share of search across all cat­e­gories. Ama­zon (2.88 per­cent), and Argos (2.26 per­cent) again per­form well for tech­nol­o­gy relat­ed share of search, with the for­mer gain­ing an addi­tion­al organ­ic search boost over com­peti­tors for it’s own prod­uct line of ‘Kin­dle’ ebook read­ers, as well as phones and tablets. Cur­rys per­form espe­cial­ly well here, with strong search pres­ence in the audio­vi­su­al and TV mar­ket (the brand have a siz­able 9.16 per­cent of the share of search in the TV cat­e­go­ry when con­sid­ered sep­a­rate­ly). The brand have a con­sid­er­ably larg­er share of search than sis­ter brand PC World who have not man­aged to achieve the same vis­i­bil­i­ty for typ­i­cal audio­vi­su­al and gad­get based search­es. In many cas­es, non-com­mer­cial web­sites includ­ing pub­lish­ers, review sites, and social net­work­ing plat­forms also won a con­sid­er­able share of search. TechRadar had the great­est share of search with 2.19 per­cent of over­all share of search, built on high vis­i­bil­i­ty for key­words such as “apple watch” and “xbox”; top­ics where they write exhaus­tive reviews and com­par­isons, which dri­ves traf­fic to their pages. Wikipedia (1.37 per­cent) and YouTube (0.91 per­cent) are sec­ond and in the over­all non-com­mer­cial share of search, show­ing that inde­pen­dent infor­ma­tion resources such as these are pro­vid­ing answers for con­sumers search­es. It’s worth not­ing that both web­sites incor­po­rate inde­pen­dent search func­tions as a means for users to find con­tent, and arguably their influ­ence is not reliant on organ­ic search but user gen­er­at­ed con­tent and their own sophis­ti­cat­ed search ecosys­tems. Review sites, CNET, PC Advi­sor, Trust­ed Reviews, and Which all fea­ture amongst the top non-com­mer­cial sites, high­light­ing the impor­tance of reviews for con­sumers as they research and eval­u­ate their pur­chas­es. At such a cru­cial time of year, organ­ic search can be a high­ly com­pet­i­tive chan­nel, and it’s no real sur­prise that the top share of search posi­tions are dom­i­nat­ed by major UK retail­ers such as Ama­zon and Argos. Both retail­ers stock a com­pre­hen­sive range of goods and appro­pri­ate­ly, have a large amount of rank­ing key­words and pages to match. There are also encour­ag­ing results for retail­ers such as Cur­rys and Toys “R” Us who have man­aged to build lead­ing organ­ic posi­tions in the TV and Toy mar­kets. In niche mar­kets, retail­ers such as Game (video gam­ing) and Smyths Toys (chil­drens toys) show that it’s pos­si­ble for spe­cial­ist retail­ers to com­pete for search­es with the major retail­ers — giv­ing them a much need­ed boost in online vis­i­bil­i­ty in the run up to Christ­mas. “Recent research by Google con­firm­ing that 20 per­cent of con­sumers start their Christ­mas shop­ping in Sep­tem­ber, and that 40 per­cent of UK con­sumers are ful­ly engaged in Christ­mas shop­ping pur­chase cycles by Octo­ber, should be a com­pelling incen­tive for brands to build an under­stand­ing of search behav­iour and per­for­mance as ear­ly as pos­si­ble. With search demand and behav­iour like­ly to change in the run up to, and over the Christ­mas peri­od, there’s still time for retail­ers to com­pete for cru­cial organ­ic search queries and key­words in their mar­kets. For retail­ers who com­mit to a holis­tic SEO strat­e­gy in time to effect change in their vis­i­bil­i­ty in the run-up to the fes­tive peri­od, the chan­nel can still pro­vide excel­lent ROI. We should point out that whilst this report shines a light on the per­for­mance of retail sites, they’re not the only play­ers in the space. Brands’ indi­vid­ual web­sites, edi­to­r­i­al pub­li­ca­tions (such as the high­ly vis­i­ble techradar.co.uk), review sites, and omnipresent infor­ma­tion resources such as Wikipedia and YouTube still influ­ence the searcher, their research, and their deci­sion-mak­ing process­es. With weeks to go, brands need to be think­ing about how con­sumers form opin­ions, build brand pref­er­ence, and make deci­sions. Organ­ic rank­ings and vis­i­bil­i­ty play a huge part of this — and there is still time to roll out con­tent strate­gies, PR and site opti­mi­sa­tion activ­i­ties to shift the bal­ance — but it’s impor­tant to think beyond key­words and rank­ings and to con­sid­er what users are look­ing for and expect­ing, and how best to meet those needs. 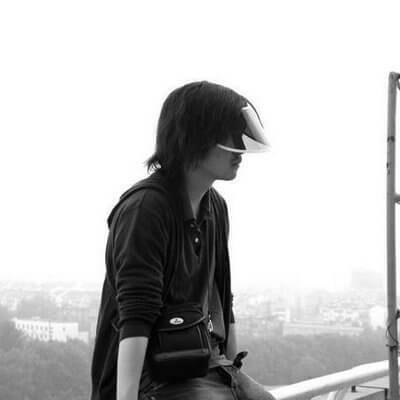 Suc­cess­ful strate­gies blend mul­ti-chan­nel activ­i­ty, con­sid­er how oth­er web­sites and brands affect their rep­u­ta­tion, and com­pete by win­ning mul­ti­ple nich­es which align with their core strengths in order to pro­vide the best expe­ri­ences for the end user. With all of this con­sid­ered, win­ning Christ­mas isn’t nec­es­sar­i­ly about hav­ing the high­est share of search — it’s about win­ning the con­sumer. 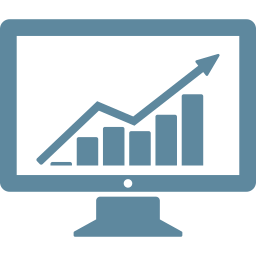 Sign up for our newslet­ter, and we’ll let you know when we release new reports, stud­ies and eBooks! Linkdex per­formed desk research to iden­ti­fy like­ly trend­ing and pop­u­lar top­ics, prod­ucts and toys for Christ­mas 2015, across a vari­ety of cat­e­gories (includ­ing tra­di­tion­al toys such as bikes and stuffed ani­mals, games and con­soles, Lego prod­ucts, Star Wars para­pher­na­lia, and oth­ers) for over 7,000 key­word terms, rep­re­sent­ing a total of 8.5 mil­lion month­ly search­es in the UK between August and Sep­tem­ber 2015. We iden­ti­fied and cat­e­gorised rel­e­vant key­words relat­ing to each top­ic or prod­uct, and used search vol­ume data from Google to under­stand and quan­ti­fy demand. The Linkdex SEO plat­form then mea­sured each of the web­sites which appear in Google’s organ­ic search results for these key­words, and cal­cu­lat­ed an esti­mat­ed share of search based on pro­pri­etary click­through-rate cal­cu­la­tions, based on rank­ing posi­tion for each key­word. As well as search vol­umes, the equiv­a­lent ‘media val­ue’ for each key­word — the cost per click val­ue from Google AdWords for each term mul­ti­plied by its search vol­ume — was also col­lect­ed, so as to enable us to under­stand the rel­a­tive com­mer­cial val­ue of each key­word. This data was then aggre­gat­ed to allow us to iden­ti­fy the most vis­i­ble and most valu­able web­sites over­all, and by cat­e­go­ry. Results are indica­tive of search behav­iour in the UK between August and Sep­tem­ber 2015, and demand is expect­ed to increase and change over the Christ­mas peri­od. Addi­tion­al­ly, over­all share of search is intend­ed to be rep­re­sen­ta­tive of a retail­er domain’s organ­ic search vis­i­bil­i­ty, and not of over­all mul­ti-chan­nel or retail per­for­mance. The data and con­tents of this report were pro­duced by the Linkdex team, using our pro­pri­eto­ry SEO plat­form and data. If you’d like to access or use this kind of infor­ma­tion, you can get a demo of our plat­form, or speak to our team.